Set out on a spectacular site overlooking the Pacific Ocean on the southwest coast of Fiji, local golfing hero Vijay Singh (in association with the design team at IMG) should have laid out the fairways at Natadola Bay, but a dispute between Vijay and the developers saw him walk away from the project. In stepped Singapore-based construction company Heritage Golf to complete the design and so Natadola Bay – boasting ocean views from fifteen of its Seashore Paspalum grass fairways – became the fifth 18-hole golf course in the island nation when it debuted in 2009. Toughest holes on the card are the 1st (index 1) and the 18th (index 2), both of which play as testing long par fours. The 544-yard 6th is perhaps the most memorable hole, with an elevated tee positioned 200 feet above a fairway that snakes right then left to the green. Best of the short holes is the 145-yard 15th, played to a green that’s protected by three front bunkers. The Fiji International was first hosted at Natadola Bay in 2014 and shortly after Brandt Snedeker’s 2016 victory, Vijay Singh (in collaboration with Ernie Els’ Senior Design Associate Greg Letsche) stepped back in to make a number of alterations to the layout ahead of the 2017 tournament. Spectacular. Actually, make that SPECTACULAR! 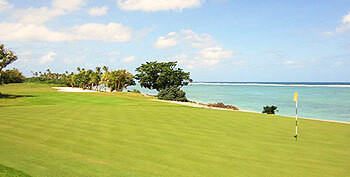 Everyone I spoke to in Fiji reckons this is the number 1 course in the country and I can't see how they could be wrong. There are coastal holes right on the lagoon, there are huge elevation changes on the inland holes and there are tough questions being asked on just about every shot. The only downside is that it's quite expensive (FJD235), but if you're a serious golfer and you're on Viti Levu in Fiji, just do everything you can to play this course.